I read this book quite quickly, seeing as how I started it on a Thursday and Friday is usually my "read everything" day. I finished it last night (Friday April 7th), and I am not the biggest fan of this novel... I'll go more in depth during this review, but I didn't like this novel as much as I expected to like it, especially since the Queen Victoria Schwab is the author! I'm just going to jump into the review because I have a lot to discuss. This cover is actually so beautiful, it makes me glad to own this book, if only for the cover. The colours as well as the inclusion of the Violin shape really shows the plot within, which if you don't know, is something I love. I also really love the font that's use'd in this cover, it's legible yet beautiful to look at. This novel follows the perspective of August Flynn and Kate Harker as they try to figure out the best way to live in a city overrun by monsters. August is a monster and he lives in South Verity, he is the "son" of the man who basically runs South Verity, and throughout the book he shows that all the wants to do is help the cause, and help get rid of the monsters who like to kill innocent humans. August just wants to be human and good, yet the monster within him doesn't allow for that to happen. Kate on the other hand is the daughter of the man who runs North Verity. Her father sells medallions to humans which prevent the monsters in his side of the city from killing them because of the "control" he has over the monsters. All Kate want's is the respect of her father, and for him to understand that she can be as ruthless as he is. The action of this novel really starts when August is met with the opportunity to go to North Verity to "spy" on Kate Harker in order to gain some leverage over her father. Yet what he doesn't expect is for them to work together to get away from assassins that are sent to kill Kate, and maybe even August. August was someone who I didn't feel much of a connection to at all; until near the very end of the novel. I didn't feel sad for his situation of being a monster when all he wanted to be was human, I didn't connect to him when he told us about his life, I didn't fear for him when he was being chased by assassins. I just didn't connect how I would have liked to. Kate was kind of a badass, but not as badass as I would have liked. She seemed like a lot of her feelings and actions were faked. We did get to know her a bit better near the end of the novel, so I'm really hoping that the next novel has more character growth for her because this one just didn't do it for me. I didn't love this novel. It didn't have enough going on for me to really get enthralled with the story, and honestly it felt like a children's novel. Of course Schwab's writing was beautiful, and the premise of this novel was such an interesting idea, but the follow through wasn't something I enjoyed. All in all, I didn't enjoy this novel. I didn't wonder what was going to happen next because about 1/4 of the way I kind of figured out the ending and the "whodunnit." There wasn't really a surprise with the ending, and no cliffhanger that left me wondering "what next?" Alright guys! 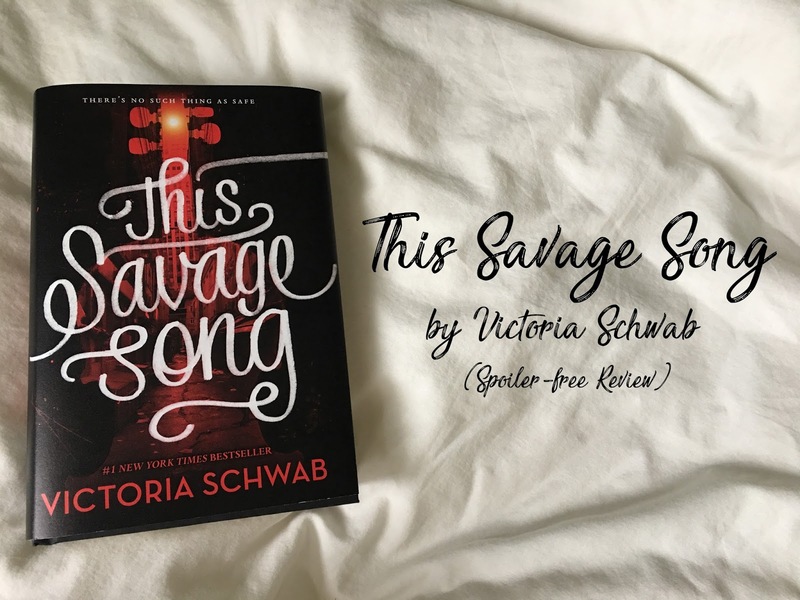 That concludes my spoiler-free review of This Savage Song by Victoria Schwab! Tell me if you've read this novel, if you have, what did you think about it? Did you like it? Did you hate it? Were you just in the middle? Let me know!